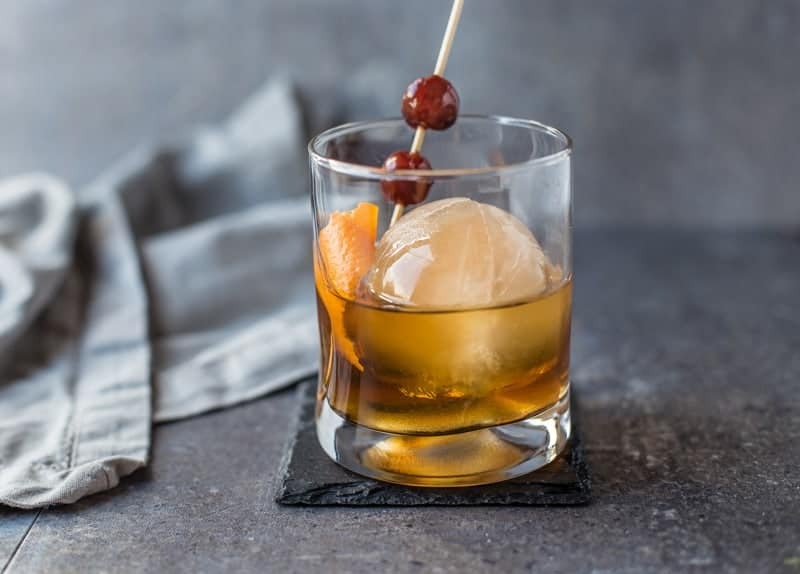 A twist on a classic Old Fashioned using Smoked Ice. Yes, that’s right, Smoked ice. 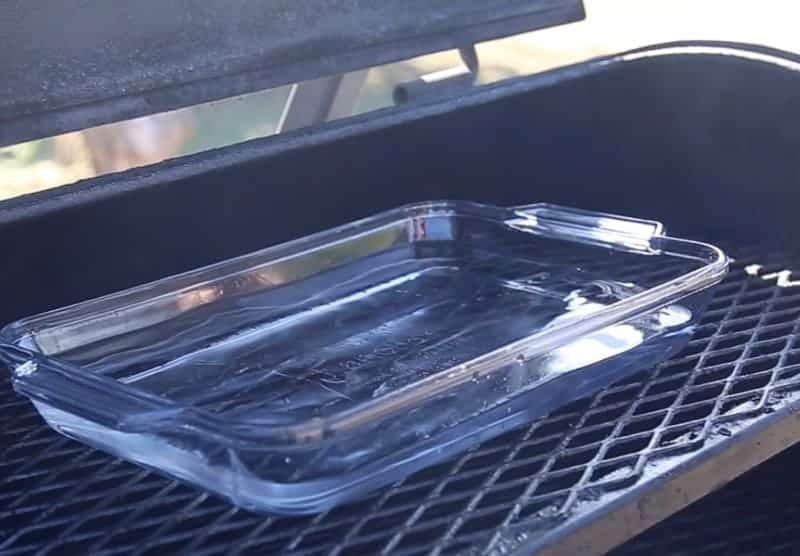 We’ve talked about smoked ice before, but we thought we’d bring it up again because it’s that time of year! You know what I’m talking about. The holidays (aka the time of year you’re going to need a good cocktail to put up with your Uncle Matt’s nonstop political talk). Yes, this cocktail is going to definitely come in handy then. Or just when you’re sick of the cold weather and want a nice warming drink, because bourbon warms the soul. True story. Plus the hubby’s birthday is coming up (Happy Birthday, Sean! ), and I made this drink originally for his 40th a couple years ago. So we’re bringing it back and making a video of it. Sean’s favorite booze is bourbon (with whiskey a close second), and he’s a classic cocktail kind of a guy. Hence our play on a classic Old Fashioned. But first, let’s talk about Smoked Ice. If you search smoked ice cocktail you will no doubt stumble across this little smoking gun tool used by bartenders all over to infuse drinks with smoke. But who the heck needs a $150 smoking gun when you have the best tool of all — A SMOKER?!?!?! No sir, I’m gonna save that $150 to stock my wine fridge and then use my smoker, a tool that I already have, to make a smoked cocktail using some very inexpensive ice cube molds. 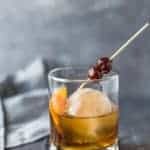 Sean wrote a pretty thorough article on how to smoke ice for Palate Press. Definitely check it out since we’re only giving you the cliff notes version here. To start all you need is a large glass bowl or dish. The size of the bowl will depend on how much ice you want to make and the size of your trays or molds. We like to maximize by making a lot, and filling up all of our molds so we have the ice cubes on hand for several weeks. In the picture below we used about 2 quarts of water. Next, set your smoker to around 200 degrees Fahrenheit (and no more than 225). 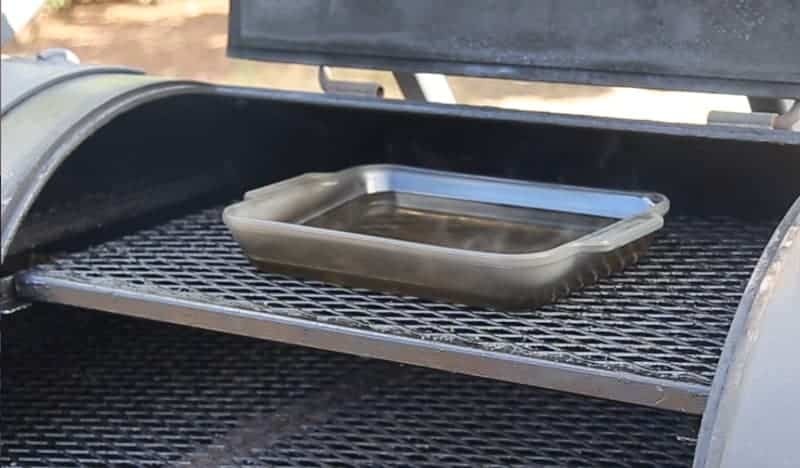 Water boils at 212 degrees, so you want to keep heat low to avoid boiling temperature otherwise the water will boil and steam out and we don’t want to lose any of that smoked water. Leave on the smoker for 2-3 hours until you’re happy with the color. You can also taste test it for flavor. Also make sure to smoke this on its own. Nothing else should be on the smoker. We don’t want meat splattering into our water (or maybe you do?). And think about the wood you use because it will be the primary flavoring agent to this smoked ice. We like cherry for the sweet flavor it give (vs. something like mesquite or oak which would impart more of a campfire flavor). When you’re happy with the flavor make sure to strain the water using a very fine mesh strainer to get any particles that may have found their way into the water. Then distribute into your ice cube molds and freeze. We have several different types of molds for cocktails. These molds, the ones in this picture, are our favorite. They’re pretty big, but they’re quite the show stoppers. They will melt slowly, giving you the opportunity to make a refill for the rest of the cube. And they’re a great deal at 2 for $10. You can also get smaller rounds ones like these. These are also fun if you want more of a perfect cube vs. a ball. We have all three styles and they all work great. Once they are frozen it’s cocktail time! This is a play off a classic Old Fashioned using smoked cherries and bourbon. You can make your own smoked cherries, but we love the ones that the ladies at Republic of Jam make. And they’re local, so we don’t need to bother making our own. But I encourage you to make your own if you feel motivated. Otherwise regular Maraschino cherries are an acceptable substitute. We also use their bitters in this cocktail, but feel free to use your favorite bitters. 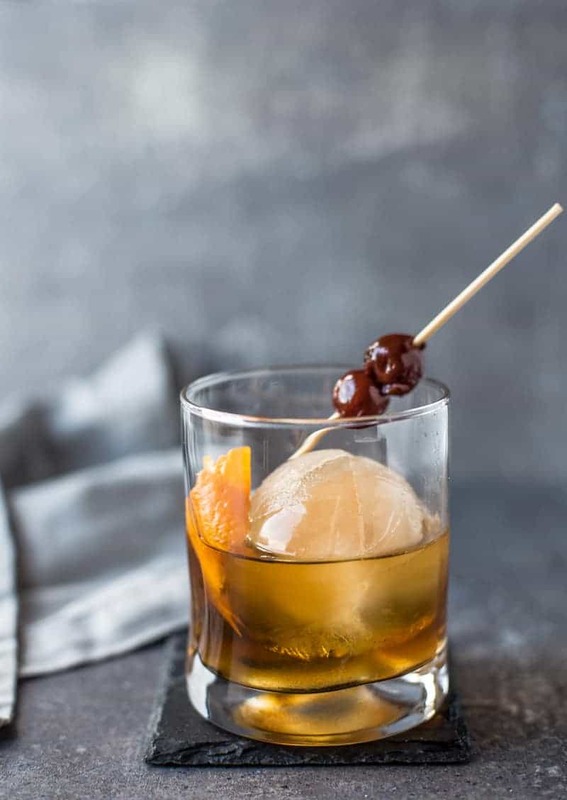 A twist on a classic Old Fashioned using Smoked Ice. Recipe and Video. Preheat smoker to 200 degrees (F). Place water in a large glass bowl or dish. Place on smoker for 2-3 hours until the color begins to change into a mild yellowish tint and you like the flavor (make sure to taste test at the 2 hour mark for flavor. You want a mild smoke influence. Remove. Strain water using a fine mesh strainer and distribute into ice cube molds and freeze. In a large rocks glass, place the sugar, bitters and bourbon and mix together. Add your smoked ice cube. Garnish with your orange slice and smoked cherries. Let the drink sit for 1-2 minutes to let some of that smoked ice begin to melt and integrate into your drink. 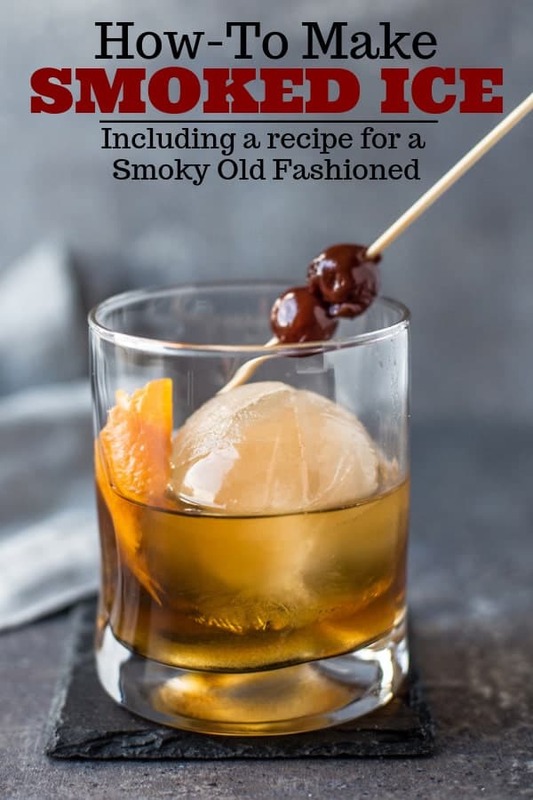 Some will add a dash of club soda or water to an Old Fashioned, BUT it's not needed here because of that smoked ice. It will slowly melt and add incredible smoky flavor to your drink.